Owen is a strong and brave five year-old who loves running climbing and superheroes. He loves to play video games, swim and is always on the go. When Owen was just 18 months old, his mom noticed that something wasn’t right. Although he was meeting all his milestones, his balance seemed off and he was having some difficulties walking. She grew more concerned when he was falling up to 30 times a day. Doctors believed that they just needed to wait and see if things improved. However, his mom knew a second opinion was needed. Cognitive tests showed there was no neurological damage. After seeing a specialist and a few blood tests were done, Owen was diagnosed with a rare disease called Ataxia-Telangiectasia (A-T). A-T is genetic disorder that causes incoordination of many motor functions, including speech, eye movement and gross and fine motor activities. Kids with A-T typically have immune system problems and are at a high rate for cancer. There is no treatment known to slow or stop the progression of the disease. He will simply take each hurdle as it comes. Owen’s life will be full of therapies to help support him and his struggles. He will most likely be in a wheelchair by the age of 10. Just this last June, Owen developed strep throat and his tonsils became inflamed, followed by a severe infection causing blisters on his hands feet, and mouth. Despite the risks involved with surgery, doctors needed to remove the tonsils and biopsy them. A few weeks after surgery, Owen’s mom noticed a lump on the side of his neck she and grew concerned, knowing A-T kids were at a higher risk for cancer. Four weeks after surgery, the diagnosis was official and Owen’s parents were devastated. He was diagnosed with Non-Hodgkins Lymphoma and his treatments began the next day. Doctors immediately placed a device in his chest to prepare him for all that he would need to fight the cancer. Owen receives chemotherapy through his double Lumen Hickman (the device in his chest) and through multiple spinal taps. 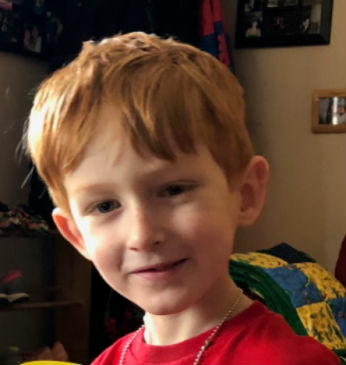 With Owen’s treatment protocol, he was unable to start Kindergarten and due to his high risk for infection has been allowed only minimal contact with others. He will need multiple rounds of chemotherapy and will not be able to undergo radiation therapy due to his A-T and the inability to regenerate new cells. In spite of all of this, Owen is a true redhead and continues to be feisty. He loves animals, video games and sports. Owen will be adopted as a Sparrow to Parkrose Middle School. Students will work hard to not only love and support him, but raise money for Owen through sponsored community service and fundraising.